Since our reporting of Kikizo's massive preview, a number of other websites have published their previews. There's not really any new information contained in any of them, but if you've been living under a rock for the last week or so then you may wish to check them out (links at the end of this post). As well as this there's been a few other announcements and articles of interest cropping up. A GTA IV article which may interest you is one published by Computer and Video Games. They managed to note down some of the radio ads they heard during Rockstar's latest demo showing of GTA IV. They include El Comercio Roboto, twin transsexuals, real estate dream, loser journalist and El Dentes. You can read some of Rockstar's habitually humourous adverts at C&VG.com. Secondly, Jeff Williams, a former web producer for Rockstar Games has written a very interesting blog post which he titles Life During Wartime - Working at Rockstar Games. It is a very interesting read, and gives you a good insight about what it is (or was) like to work at Rockstar. It's quite long though, so you better have a bit of spare time. Now if you read about this from some gaming sites, you may also want to read his follow-up post, in which, he clarifies a few things which had been inaccurately reported by some websites. Finally, if you haven't read through Kikizo's extensive preview or any of the other big sites we linked to after that, here are a few other previews which we haven't mentioned. No new information of course, as they all received the same demo. Also in related news, Rockstar have announced a new franchise available exclusively for the PlayStation 3. We have no idea what it is yet, but it is not L.A. Noire. One would imagine this is likely to be what Sony are getting instead of exclusive content for GTA IV. You can read this announcement over at PlayStation.Blog, and discuss it in this thread in our forums. 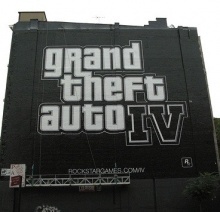 Here are the unwatermarked screenshots and artwork from the previews of GTA IV today. Some are brand new, some are higher res versions of old screens, and there is fuller artwork of Elizabeta. If you haven't read any of the previews that have gone online today then you really are missing an awful lot of information. That link leads of our news post of Kikizo's 10 page preview, a site that in our opinion is putting a great deal more effort into their previews than any other sites, filling us in with information that everyone else is missing. However, below are some links to some of the other big gaming sites on the web who have also published previews. Just as promised earlier, Kikizo has released a staggering 10-page preview of Grand Theft Auto 4. This preview has an incredible amount of information. Kikizo notes this as well, claiming every other gaming magazine and website "missed important information." En route to Rotterdam, Kikizo spotted a pizza store selling food for 99 cents and a cocktail bar with a bright pink sign called "Bahama Mamas"
There is a theatre called "T.S. Pirate at the Thespian Theatre" as well as a camera store called "Liberty Cameras". Kikizo said that it seemed like the same exact camera store they bought their camera in in real life. Phone calls extend the concept of non-linear gameplay, according to Rockstar. Whereas past GTA games have been about accepting missions, now that line is blurry and you actively take more of a part in telling the story yourself. Weapons in GTA4 are a "precious commodity" and are "not easy to acquire"
Kikizo reported that they had no concern whatsoever on technical issues in the game, other than when they slowly pan the camera, the windows on the buildings begin to get jittery as they reflect the world. They also noted this is not the case in typical game scenarios. Niko Bellic is 'a small fish in a big pond'. Niko will whistle to get a cab's attention, then press "Y" (on the Xbox 360 controller) to get inside. You're given the options to relax and watch the ride, do a trip skip, or pay double for the driver to go twice as fast. The player views the world from Niko's perspective while in the cab and you can interact with the driver while he is driving you. The game is now fully confirmed to make extensive use of HDR lighting. Car/person interaction physics are now fully in place, meaning if a car suddenly brakes, the people inside are thrown forward. The interiors/exteriors are completely seamless and the outside world can be heard, muffled, from the inside. Advertisements in the [email protected] internet cafe claim internet access for , offer "totally wireless" internet, and accept credit cards. Niko has his own, unique computer account so he is able to access his information from any computer in Liberty City. The mouse cursor is controlled with the analog stick. Niko's fake resume claims his objective is to "rise to the top of my profession in Liberty City," that he has experience in criminal law with cases like manslaughter under his belt. He also claims that he deals with the emerging markets in the West Indies (especially 'Jamaica and Puerto Rico'). He also claims to have been the associate attorney at Mediterranean Shipping Enterprise, and an intern at a police force. His school is supposedly 'Walford University' in the UK. From the people who brought you the Domestobot, we proudly present El Comercio Roboto! It's the robotic future... from south of the border! 'Politicians may demand illegal aliens leave the country, but I want a Mexican gardener I can ogle!' El Comercio Roboto! You little devil. He can mow the lawn, if you know what I mean! Comes with six different attachments! Are you ready to live the real estate dream? Whether you're new on the market or an old hack, we'll take your dream to the limits of prestige, in a spacious loft or an outstanding penthouse! It's a 500-square ft glass coated box in the sky, with windows that won't open and a doorman that masturbates in your bed while you're at work! Only three million dollars, only three blocks from the ghetto! You can begin living a life of luxury. Why worry about health, your weight, or what people think of you? Now, you're faster! Motorized scooters are the future of the American lifestyle - carefree! Take the wait off! The game engine has sounds that can compete with the likes of "Forza Motorsport" and "Project Gotham Racing"
Inside of the cab you can change the next music track if you'd like. Car lights light up "convincingly" and reflect the street and the surroundings. In Kikizo's journey towards the park (for the mission in which Niko must retrieve a memory stick for McReary), they passed through "Chinatown, Presidents City, Lancet, Hatton Gardens, Middle Park East, and a stretch of freeway, on to Lancaster, and Ruby Street." The name of Niko's cell phone network is "Whiz." Once Niko has the memory stick, he must greet McReary by "heading down Cod Row, Denver Avenue, Exeter Avenue and stop at Northwood / East Holland." To get the suit for the interview, Niko must go "to Silicon Street, through Quartz Street, and Middle Park East." To get to the law firm, Niko must go "past Star Junction, The Triangle, Easton, Chinatown, Diamond Street, and Calcium Street." Many things were still kept secret about the game. Kikizo was forced to leave the room while Rockstar worked with "secret menu stuff" after Niko was "wasted" by police in the demo. As we have reported earlier, many new previews will be on their way soon enough. A partially unexpected one has recently arrived from Playstation Magazine USA. The preview doesn't include many new details, but it has a few interesting tidbits worth knowing about. A green band around the HUD (Heads Up Display) indicates your health. It has now been confirmed that Liberty City is not as big as San Andreas physically. It covers about 3/4 of the total area San Andreas did. In the final part of the preview, Niko is killed by a police helicopter landing on his head. This could either be a glitch or some really intense gameplay. The default camera view is no longer stuck above the vehicle, instead it drops down to the left, following the middle of the road. More previews will be on the way soon enough, remember to stay tuned to TheGTAPlace for all of the latest updates. Credit goes to GTA4.net for this update. Just a heads up to everyone simply to say that a number of gaming sites are expecting GTA IV previews to go up tomorrow, so keep checking back here for more updates on them as they happen. We hear they'll be based on the same demo recently reported on by magazines including GamesTM and Games Aktuell, but there should be some new info from them as well. We should also see higher res digital screenshots of the images seen in recent magazines, and hopefully some new ones too. Kikizo is just one website publishing a preview tomorrow, they note a time of 1PM EST for it going live (that's 6PM GMT), so expect to see something from them around that time, and I'd guess other gaming sites too. We'll of course be reporting on all of them right here. German magazine Games Aktuell (on sale from today) has a new preview on GTA IV, which also includes 20 new screenshots. There were a few tidbits of information flying around the other day, supposedly from this magazine - there were some very sketchy details in it, specifically regarding K9 Units - it turns out these were fabricated by another GameFAQs user. This info below however, is real information from the magazine, translated into English. Taxi drivers play a very important role in Liberty City - With just a push of a button, Niko can get a ride from "A to B" straight away. Additionally, the taxi driver will fulfil some of Niko's requests, for example if Niko is hungry, the cab will drive him to the nearest fast food restaurant. If hurt, then he'll drive to the hospital - places are accessible very quickly this way. It takes Niko roughly 3 seconds to hot-wire a vehicle. The editors reported seeing vehicles including Ferraris, Porsche Carrera (Comet), Volkswagen Jetta, BMWs, Mustangs, SUVs, delivery vans and garbage trucks. Rockstar demonstrated the game to Games Aktuell on a 60" plasma screen, which didn't have Full HD capability - "this didn't matter because all Rockstar games are programmed "only" in 720p, with 1280x720 pixels" - this is an interesting quote as a lot of people have wondered whether they'll get to play the game in full 1080i/p resolution, seems like it will just be 720p for now, at least on the Xbox 360. It's not known whether the PS3 version will be able to take advantage of the higher resolution. Of course, both consoles can always upscale the game. Thanks to GTAEngine.de for the scans (now removed) and GTA-Xtreme.de for the info. Another vehicle is confirmed as it is noted that Niko stole a black Comet before heading off to the Humboldt River Viewpoint to kill the man who has McReary's memory stick. Before Niko submitted his C.V. to the Goldberg, Ligner & Shyster website, OXM noticed that his C.V. notes that he was on the "Balkan Peace Force" and that he is adept at swimming, shooting and boxing. Karen is the name of the receptionist from Goldberg, Ligner & Shyster, who calls Niko to notify him of his interview. It's not known if she is an important character or not. There are no references to the September 11th terrorist attacks anywhere in the game. OXM: You've talked about picking culturally different neighbourhoods. Can you reveal any of the gang cultures apart from the Russians? Thanks to jester210 for the scans. PlayStation 3 Exclusive Content As Well? "As the head of the [internal Sony] studios, it's hard for me to comment on the third-party relations, so I don't know the details of that -- we deliberately keep those separate -- but we have a great relationship with Rockstar and we're actually working closely with them on a number of initiatives, so I do know some things that are going on, but I'm not able to share those with you now." This does not mean that Grand Theft Auto: IV on the PlayStation 3 will have downloadable content like the Xbox 360, but it's looking more likely that you PS3 owners will get something special. What that is we don't know yet, but stay tuned to TheGTAPlace for all of the latest updates on this matter. We've just got word from Rockstar about the first teaser site they've launched, WKTTRadio.com. You can phone in have your opinion on Liberty City heard on the radio! It sounds pretty cool, so head on over to WKTT Radio if you fancy your chances of being a voice artist in GTA IV! I wanted to give you a heads-up about this site that has just gone up. Be sure to check it out and let everyone at your site know about it. "Little Jacob", an arm's dealer is said to be a good friend of Niko's cousin, you can buy weapons from him. The weapon's are in the trunk of his car, and the method used to purchase the weapons is very similar to the way you would buy weapons from an Ammu-Nation in the other GTA's. Niko meets with "Little Jacob" in Rotterdam Hill, in Alderney (the game's recreation of New Jersey). There were no arrow's on top of certain people you had to kill, you have to figure out who to gun-down on your own. You must maintain and develop relationships with people and friends. (You maintain them by being loyal to the person, etc.) If this means Niko could have a girlfriend if he maintains a relationship with a certain women is unknown at the moment. McReary, is the "corrupt cop", and he has "dirt on Niko's past". PLAY previewed a mission by the name of "Call And Collect". Keep checking TheGTAPlace for many more updates on magazine articles like the one above! Thanks S-4 Gore, for the scans and info! Today was Microsoft's E3 Press Conference. Peter Moore barely touched on GTA IV, but he did in fact mention it. What he did mention was that the Xbox 360 would be receiving "two exclusive episodic content packs", and that they would both be arriving on, and only on the Xbox 360 before the end of Spring 2008. Peter Moore also mentioned that you would only get "the full experience" of the game on the Xbox 360. (Due to it being the only one receiving said exclusive content.) The second Grand Theft Auto IV trailer was also played with no changes at the conference, and he said that both GTA IV trailers were running in real time, on an Xbox 360. Also, during the press conference, Moore went on about how the top five best selling game on the Xbox were GTA III, GTA: VC, GTA: SA, Halo, and Halo 2. He had also said that the only system you'll be able to play "Halo 3, GTA IV, and Madden '08 all on" will be the Xbox 360. So, the only GTA IV news at this conference was the fact that both episodic content packs would be arriving before the end of Spring '08 (previously, we only knew they would be arriving before "the end of 2008".) If any more Grand Theft Auto-related news hits this E3, you know it'll be posted here on TheGTAPlace, so stay tuned! Thanks "Busby" for reminding me about the trailers running on an Xbox 360! 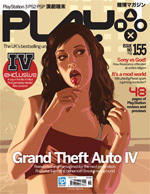 UK magazine Games� has the world's first hands on preview of GTA IV's new gameplay. There are many new screenshots in the article, as well as a fair amount of new information. Times Square is called "Star Junction"
On one mission, Niko must retrieve a memory stick with sensitive data on it from a person identified as McReary. The problem is that McReary is standing with a group of people and Niko doesn't know who he is, so he takes out his cell phone and calls McReary. When the now-revealed target pulls out his cell phone, Niko walks up and puts a bullet in his head. Niko received a call in the demo, which concerned a "shady lawyer" by the name of Goldberg, of Goldberg, Ligner & Shyster. On this mission, Niko must upload his resume to Goldberg, Ligner & Shyster's website, get an interview, and kill Goldberg. In this mission, Niko purchased a 00 suit from a clothing store called "Perseus," then ventured to the law firm and talked to the secretary over the intercom, before being let in. Niko then went to see Goldberg and promptly killed him. This caused the secretary to trigger the alarm and Niko to receive a 3-star wanted level. The draw distance is "unreal"
This is certainly exciting, as never before have players been able to "surf the web" in a GTA game. The police also seem to be much more vigilant and realistic in the game, as in the missions Games� played, killing a single person warranted a 3-star wanted level on both occasions. Thanks, killyourtv for the scans. In a surprise to nobody, Sony today announced that it would be making available a new 80GB version of the Playstation 3 console, and lowering the price of the 60GB version by 0. Sony states that it will sell the 80GB (which includes the racing game Motor Storm) version of the console for 9 and set the price of the 60GB version at 9. This, of course, only affects North America. In Europe, the price remains more than double than in America. Beginning in August, the new PS3 model will be available in North America for a suggested retail price of 9/9 CND and will be sold with the popular online-enabled racing game MotorStorm. In conjunction with this news, the company also announced that effective immediately, the current 60GB PS3 model will be available in North America for 9/9 CND, or 0 below the original launch price. This could possibly influence not only buyers of GTA4, but also Rockstar's decision to keep their downloadable content exclusive to Microsoft's Xbox 360. This news comes after Microsoft's decision to extend the warranty on all Xbox 360 consoles because of prevalent hardware failures. Will this affect GTA4's console userbase? Will more people buy the PS3? Stay tuned. Trailers made by fans of the Grand Theft Auto series have increased in popularity a lot since the first GTA IV trailer came out some months ago. Some aren't very good, others are. 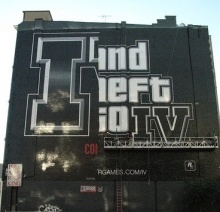 Either way, we rarely post about any, but in this absense of any real GTA IV news, we thought we might as well. Today I was emailed a link by by Gametrailers user Brotha, who has taken time to recreate the entire second trailer, Looking for the special someone, using San Andreas. In my opinion his effort put into making this has turned out pretty well, so check it out over at Gametrailers or below this post. Brotha also recently recorded his own analysis of the second trailer, which you probably know all about by now, but if you don't, be sure to also watch that. Bigger versions of those images of the building can be found at "nicknormal"'s Flickr. If you want to see the building for yourself, it's located at "the corner of Greene Street and Canal in New York City". This seems to me, to be the final logo for the game. It's on the official website, they're using it on advertisements, it was in a few magazines, I'd expect to see this logo on the final box art for the game as well. Thanks Gerard, Adriaan and nicknormal. The first confirmed voice actor to be playing a part in GTA IV became known yesterday. Ruslana, winner of the 2004 Eurovision Song Contest is apparently flying out to New York to record her voice for Grand Theft Auto IV. The character she is voice acting for is being kept a secret for now, and unlike other game publishers, Rockstar like to keep quiet about actors and actresses working on their games, so don't expect any answers soon. In addition to voicing, the Ukrainian star is also going to have some of her songs used in the soundtrack for the game, both from her previous albums and current album. We'd take a wild guess here and say these will form part of the "Eastern European dance music" radio station which one of the Xbox magazines spoke about a couple of months ago. You can find out more about Ruslana on her official website. Today we have some updated artwork for you, courtesy of Microsoft after they recently updated the GTA IV page on Xbox.com to reflect the theme available on the Marketplace. First of all we have digital copies of the blade backgrounds, which I had taken photos of the other day. Unfortunately the images are quite small, but they're better than nothing at all. Our artwork page has also been updated with these images.